Black Friday and Cyber Monday may take the spotlight in the holiday shopping season, but they aren’t the only two opportunities to get some amazing deals. 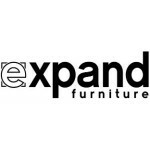 If you are looking to treat yourself to some new furniture this holiday season, you still have a great chance to get some stylish and space-saving furniture from Expand Furniture. Some of our best deals and bundle packages will be available throughout the month of December, giving you a great chance to get high-quality furniture at an affordable price. If you buy now, you may even be able to get the furniture in time for your holiday entertaining. Just because you live in an apartment doesn’t mean that you can’t enjoy a sectional sofa – and it certainly doesn’t mean you have to sacrifice quality and comfort. The Soft Cube shows that you can have it all. 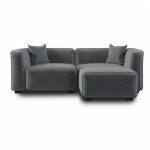 This compact modular sofa is big enough for two, and you can order it with an ottoman, creating a smaller version of the sectional that’s perfect for an apartment. The modular cubes easily come apart to create two comfortable chairs if you need individual seating. Right now, you can save up to almost $500 on The Soft Cube. Pricing depends on the configuration you choose, and can be as low as $1,295 for the basic two-seat sofa. The Bridge is a beautiful, modern dining table with a unique design. The glass table top reveals the almost industrial design below. A metal mechanism for expanding the table sits on top of geometrically carved wooden legs. The table is a conversation piece for its beautiful look alone. When people find out that it can expand to seat up to 12 diners. Use the table as a work desk or small dining table when it’s just you at home, and expand it when you have company. Normally, The Bridge expanding dining table sells for $1,995. 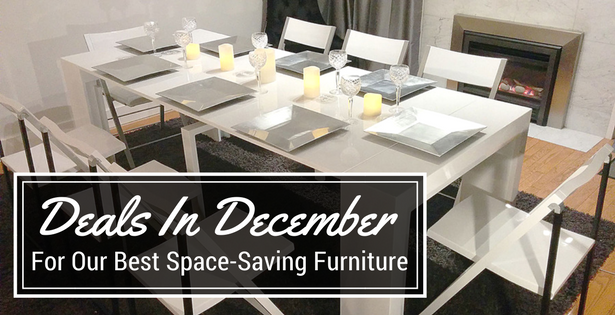 Throughout the month of December, you can save $200 on this modern, space-saving dining table. Dining tables can be a bit boring. They are often little more than a piece of wood on top of four wooden posts. The Branch is a marked departure from this mundane design. 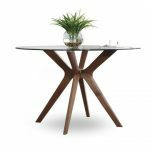 The compact dining table is a piece of art unto itself – a round, glass table top resting on angled wooden legs that come together in an interesting design. The Branch is not an extending dining table – it has a compact yet elegant design that helps you make the most of your space while also giving you a comfortable dining area for four. It’s perfect as a dining table for an apartment or a table for a breakfast nook or even a cozy patio. Right now, you can enjoy introductory pricing on The Branch. Save $400 to get The Branch for only $895. If you get the expanding dining table, you are going to need the chairs to go with it. We have deals on dining sets to ensure you have everything you need at an affordable price. 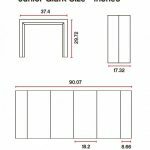 For example, you can get the Junior Giant extending table – which expands from a single desk or table for two to a dining table that can seat up to 12 – and folding chairs. You can save up to $400 on the set, depending on what configuration you choose. Several other deals are available on dining tables and chairs. You can browse the current sales here. Space-saving chairs aren’t limited to folding chairs. 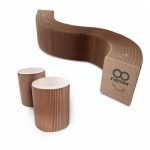 The Flexyah stools and bench use technology that lets them fold out or condense just like an accordion. When you need seating, just open up the stool like a fan or pull open the bench like an accordion. 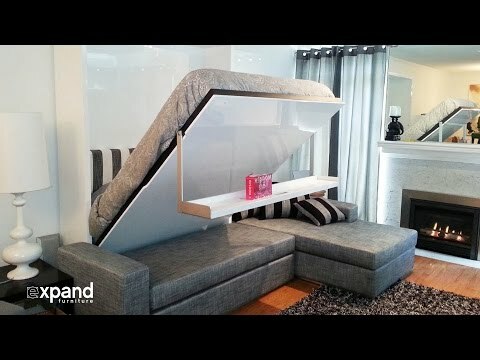 The seating is strong and sturdy, and it provides a comfortable place to rest. You can save by purchasing this bundle with one Flexyah bench and two stools for just $349, saving you $50. If you prefer, you can get the Flexyah set in brown. Either set would make a great Christmas gift for your college student or anyone else enjoying small space living. 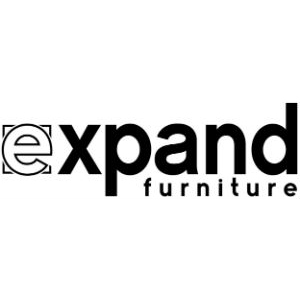 So many of the space-saving furniture pieces at Expand Furniture are designed to work well together. We are happy to put together a bulk discount for you if you want to buy several pieces at once, such as a Murphy sofa and a TV stand for your living room and a space-saving dining table and folding chairs for your eating area. 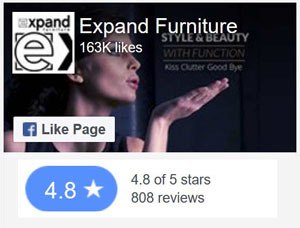 You can buy all the pieces you need for one room, or you can re-furnish your entire house or apartment. Just contact us to find out what kind of discount pricing we can offer on the pieces you want to bundle. Check our sales page frequently to find out what other deals will be available throughout the month of December and beyond. 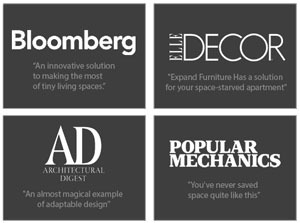 It doesn’t have to be Cyber Monday for you to enjoy fantastic prices on space-saving, high-quality furniture that will elevate the look of your home and help you get more functionality from it at the same time. You’ll make your home feel bigger and look more stylish at once.